Pen and watercolor. "Palm Trees." Ponte Vedra, Florida (September 2012). Prints available. Copyright © 2012 - 2017 Jennifer Russ, All Rights Reserved. 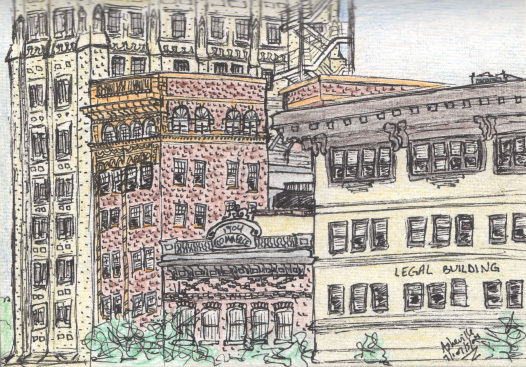 Pen and watercolor. 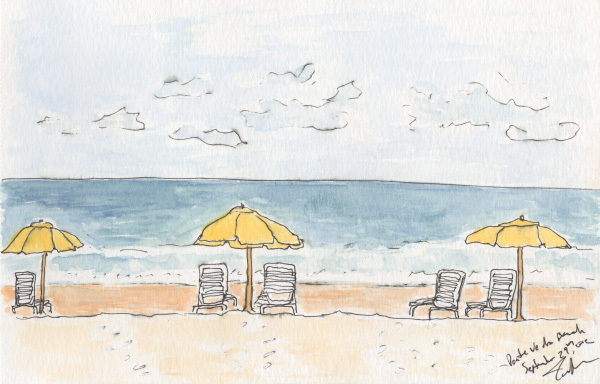 "Beach Chairs" Ponte Vedra, Florida. September 2012. Prints available. Copyright © 2012-2017 Jennifer Russ, All Rights Reserved. 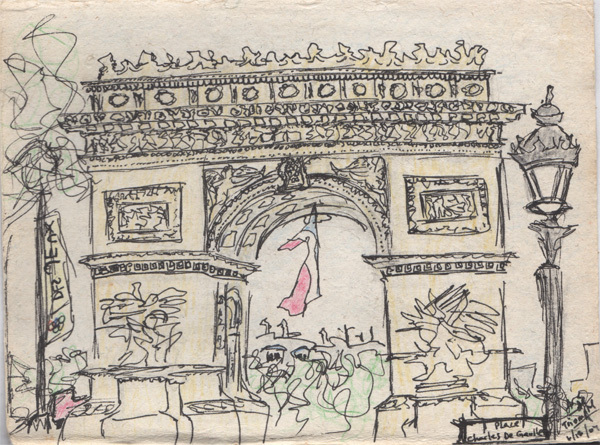 This is one of my favorite sketches from France, and one that has been well travelled. It is the first sketch I made in my leather sketchbook. It took quite a while, and at one point, some Japanese tourists asked if they could take my picture, which I found flattering, and at the same time amusing. I didn't mind, but I sometimes wonder what became of that picture... Pen and colored pencil. "Arc de Triomphe" Paris, France. June 2004. Copyright © 2004-2017 Jennifer Russ, All Rights Reserved. Pen and colored pencil. "Eiffel Tower" Paris, France. June 2004. Copyright © 2004 - 2017 Jennifer Russ, All Rights Reserved. 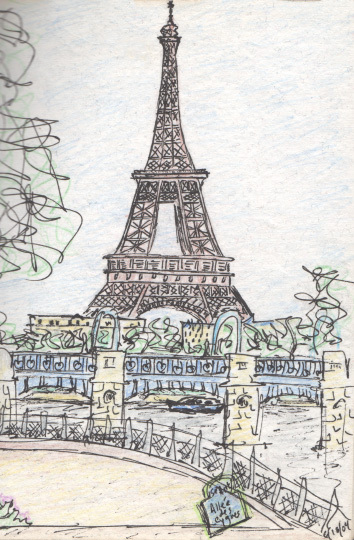 I made this quick sketch as we were traveling south on the TGV from Paris to Montpellier. Pen and colored pencil. French countryside. June 2004. Copyright © 2004 - 2017 Jennifer Russ, All Rights Reserved. Pen and colored pencil. Château de Bionne in Montpelier, France. June 2004. Copyright © 2004 - 2017 Jennifer Russ, All Rights Reserved. Pen and colored pencil. 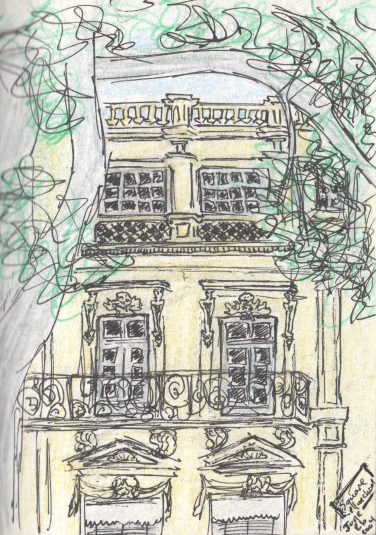 A building in Montpellier, France near a park where I was sitting. June 2004. Copyright © 2004 - 2017 Jennifer Russ, All Rights Reserved. 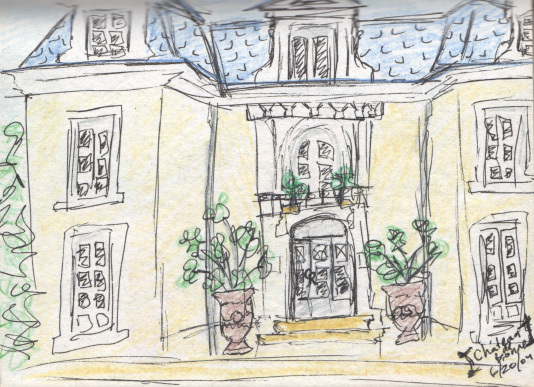 Pen and colored pencil of houses on Edisto Island, SC. July 2004. Copyright © 2004 - 2017 Jennifer Russ, All Rights Reserved. Pen and colored pencil. Downtown Asheville, NC. July 2004. Copyright © 2004 - 2017 Jennifer Russ, All Rights Reserved. 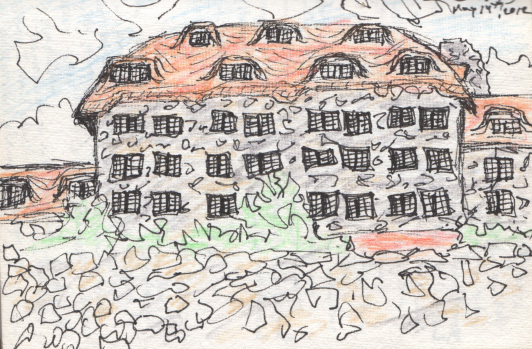 Very quick pen and colored pencil sketch of the Grove Park Inn, Asheville, NC. May 2012. Copyright © 2012 - 2017 Jennifer Russ, All Rights Reserved. 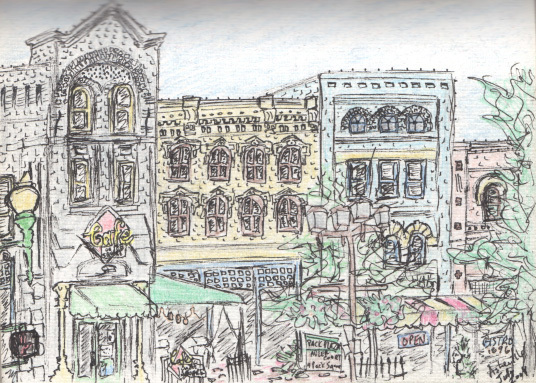 Pen and colored pencil sketch of Pack Square in downtown Asheville, NC. July 2004. Copyright © 2012 - 2017 Jennifer Russ, All Rights Reserved.